Hudson Area Moms Group is a community of moms, dedicated to enriching their days, their children and the community that surrounds them. Our group is composed of working moms, stay-at-home moms and everyone in between. 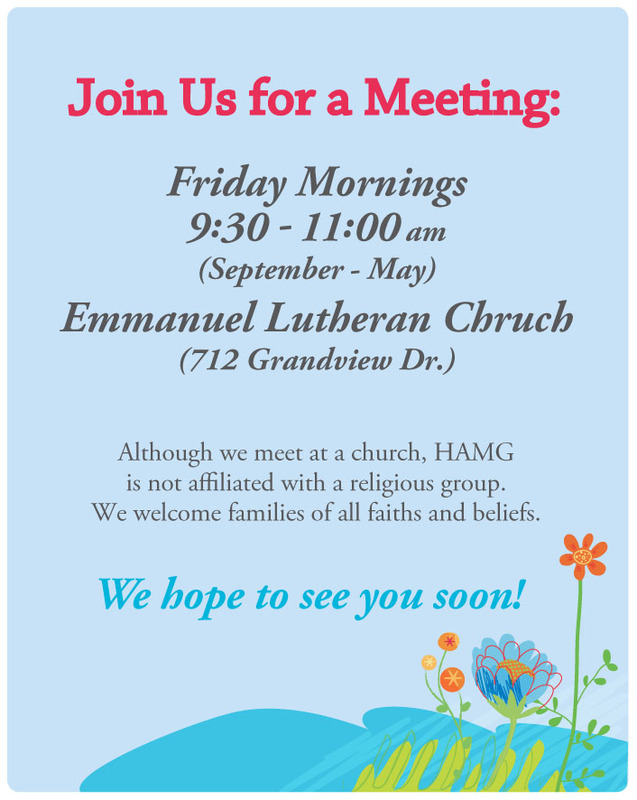 All mothers and children in Hudson and surrounding communities in the St. Croix Valley are invited to join! We play and explore. Apple orchards, play groups, parks and toddler crafts make us happy. We love to get out and about in our area, helping our children discover new things and favorite places. We talk and listen. Weekly meetings are a chance to connect with other moms, by lamenting about baby's sleep habits or toddler's tantrums over coffee, or listening to speakers on relevant topics to your life. We have optional on-site childcare for 12 months and older too! We give back. We give back. Whether we are helping you by bringing meals after your baby is born, or helping our community through various service projects, nothing warms our hearts like the act of serving others. We laugh. Everyone is accepted in our friendly and relaxed group. And nothing boosts our spirits more than a little time out with adults, through our Book Club, Craft Nights and various mom's only events. We are so glad you found us! Please click the 'About' link at the top of this page and then click the 'Membership & Meetings' link for more wonderful information about our group.